While Stuart's mom was in town, we decided to show her around Dallas. Well, not really. 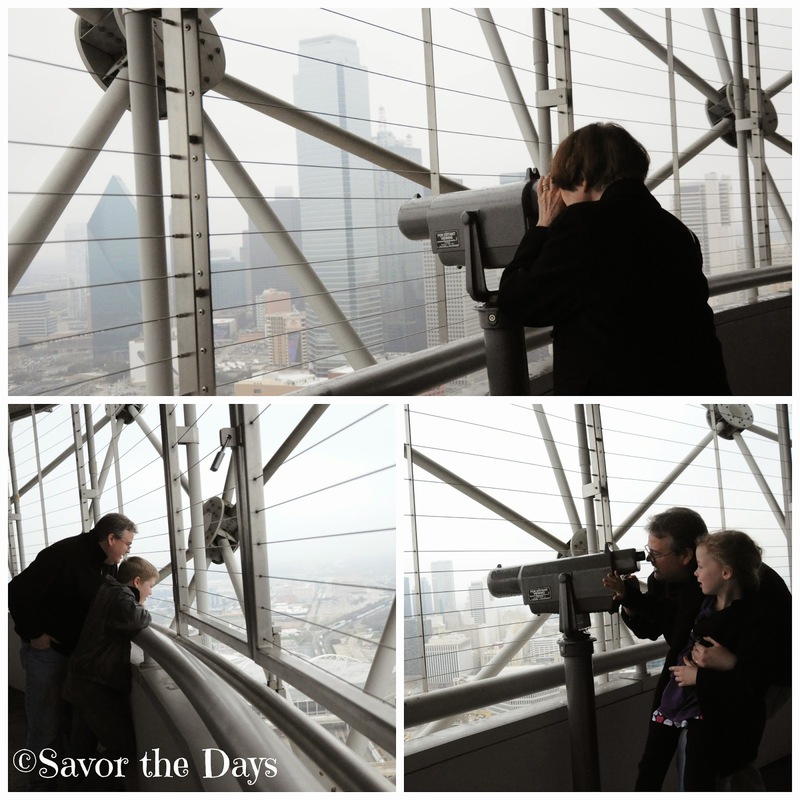 We just took her to the Reunion Tower Geo Deck so she could get a 360 degree view of the city for herself! The ball on the top of the tower is always a recognizable piece of the Dallas skyline. It's cool to watch the various light shows displayed on the ball. However, inside the ball is pretty cool too. We had lunch at Cloud 9. The food was just cold sandwiches (and rather disappointing sandwiches at that!) but the view was amazing even on this gray overcast day! The outer ring of the floor rotates so you can sit and eat your meal while your view is constantly changing. It takes about one hour to rotate one time around. What a fun way to see Dallas! After we ate, we headed upstairs to the Geo Deck. Inside there are lots of interactive high definition cameras and computer screens. There are some that play historical information such as the story of the assassination of John Kennedy which happened in downtown Dallas. I enjoyed watching a screen that showed the different light displays that are seen on the ball during each major holiday. I love how the light displays can be so customized. The kids were excited about the screens that they could control like this one that Rachel played with. She was able to control the colors and numbers of lights that shone from the tower ball by the number of fingers she used to touch the screen. We found that we could control several cameras on top of the tower. We were able to use one of them to find our van in the parking lot! We went outside at the Geo Deck to get a better live view of the city from 470 feet above it. The telescopic lenses were free to use and we all had fun taking a closer look at the city and people below. The Geo Deck is located at the top of Reunion Tower in Dallas. The address is 300 Reunion Blvd. East. Admission is $16 adults, $14 seniors, and $8 for kids. The Geo Deck is open 364 days a year, closed on Christmas Day. Their hours are 11:00 - 9:00 Sunday - Thursday, 11:00 - 10:00 Friday, and 10:00 - 10:00 Saturday. For more information, please visit the Reunion Tower Geo Deck website.